When it comes to stair design, it’s not always practical or cost-effective to design and build a fully code-compliant stairway. 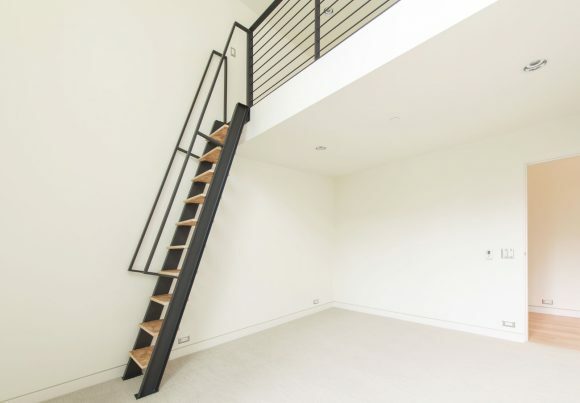 We’re not advocating breaking code for the main stairs throughout the house, but rather those to access smaller spaces like roof terraces, storage lofts, reading nooks, or other areas that aren’t considered primary living or working areas. Code-compliant stairways take up quite a bit of area, they can be expensive, and their dimensional requirements can be excessive for the infrequent traffic of nonessential spaces within residences and commercial uses. Today’s post takes a deep dive into nonconforming stairs and identifies important building code exceptions pertaining to stair design. We’ll also cover some useful drawings and photos of built examples of nonconforming stairs from the BUILD portfolio. To start, we’ll need to eat our spinach by reviewing a couple of key provisions from the relevant building codes. 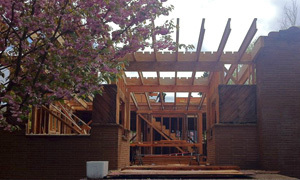 While the 2012 International Residential Code (IRC) is the most rational place to start for a single-family residence, the internationally adopted version doesn’t actually offer any useful exceptions to stair design. Section R311.4 on Vertical Circulation and section R311.7 on Stairways prescribe code-compliant stairs and ramps regardless of the application. 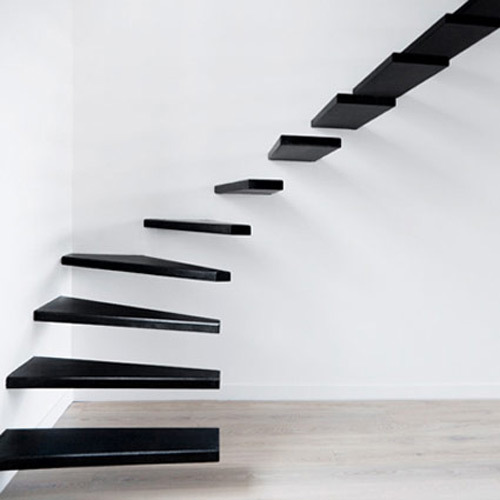 While there is an exception for circular stairs, we find that these types of stairs rarely provide the solutions offered by nonconforming stairs. 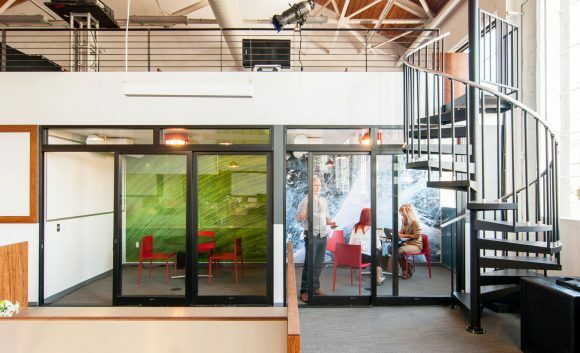 We do occasionally use circular stairs where the area consumed by the stair isn’t critical (circular stairs take up more space than you might expect) and the look of the circular stair geometry is more desired, like in the Creative Live San Francisco Headquarters below. Exception: Stairs or ladders within an individual dwelling unit used for access to an area of 200 square feet or less, and not containing the primary bathroom or kitchen. This is a game-changer of an exception, and if you’re using the Seattle Building Code (SBC), you can find a similar exception under 1009.18. Whether you’re referencing the Seattle Building Code or the International Building Code (IBC), you’ll also find exceptions for Winder Treads (IBC 1009.7.3), Curved Stairways (IBC 1009.11), Spiral Stairways (IBC 1009.12), Alternating Tread Devices (IBC 1009.13), and Ship Ladders (IBC 1009.14). 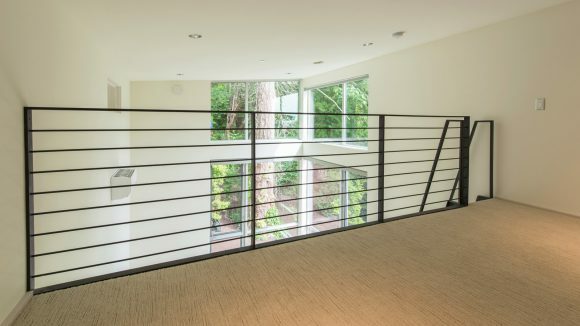 The common denominator here is that when the space being made accessible by the vertical egress is under 200 square feet (along with the specific requirements of each code provision), a code-conforming stair is no longer required. This is an incredibly useful exception that makes vertical circulation much more sensible, typically more cost-effective, and affords architects and designers a greater amount of flexibility with the design of the vertical circulation. Now, let’s get into some examples. Our Case Study House series aims to experiment with and optimize different systems for building modern residences prior to designing them into our client-based projects. The nonconforming stair is the perfect example of one of these systems, and the CSH2014 uses one to access a rooftop deck. 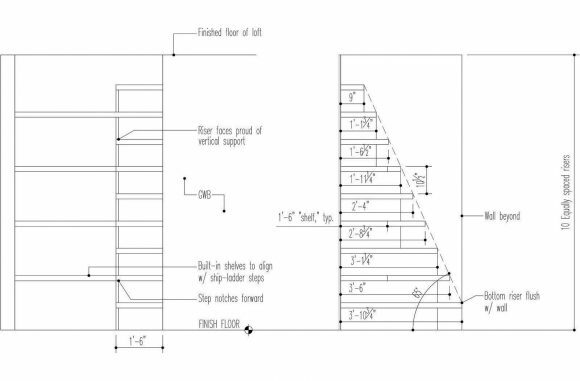 This application tested out the ergonomics of the rise, run, and head-clearance of a nonconforming stair, as well as the overall feel of ascending and descending. You can draw and measure all you want in the office, but some elements of design simply need to be field tested at the 1:1 scale. Building this into one of our own projects proved a successful test and we’ve used similar designs several times since. 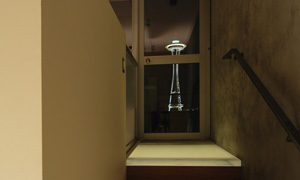 The primary design driver of this nonconforming stair is the length of the roof-hatch door above, it sets the dimensions of the nonconforming stair below. 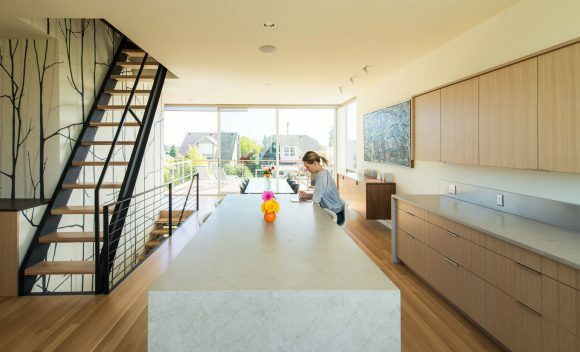 This application is noticeably steeper than a code-conforming stair and requires a bit of care to navigate, but it works quite well given the less frequent use of the roof deck and the geometrical limitations of the space. This particular stair, in true Case Study House fashion, set the precedent for future nonconforming roof access stairs. 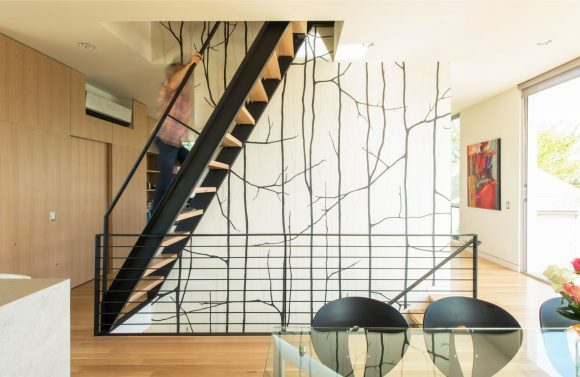 The nonconforming stair of the CSH2014 was constructed with blackened steel channels, solid oak treads stained light gray to match the floors, and a blackened steel handrail. 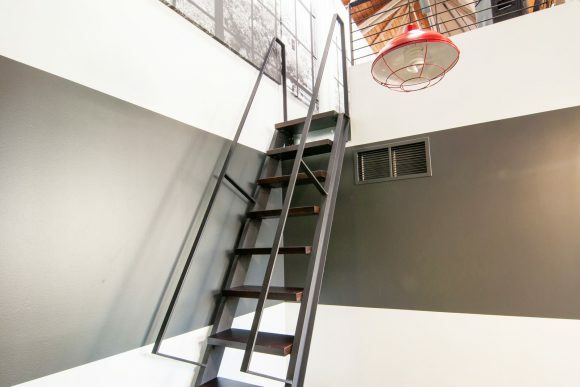 Due to the extremely high ceilings, there are several storage lofts located throughout the Creative Live San Francisco Headquarters and the nonconforming stairs offer practical access without using up valuable floor area. The nonconforming stairs are also used as a bit of visual pop in some areas of this commercial space. Once again, blackened steel channels offer a structurally sound and aesthetically clean profile, while dark walnut treads keep a consistently dark composition. Minimal blackened steel handrails help with the climb. In order to maximize the usable area of the Mercer Island Project, a series of loft spaces were designed into and above the bedrooms. 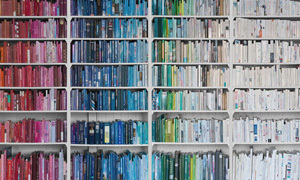 These allow for storage, reading nooks, or simply cozy spaces to retreat. Because the tall shed roofs were already part of the design, the additional space is very cost-effective. Maximizing the usable floor area at bedrooms is crucial and the nonconforming stairs in this residence were the only solution. Code-conforming stairs would have taken over valuable floor area to be feasible, thereby eliminating the possibility of loft spaces. 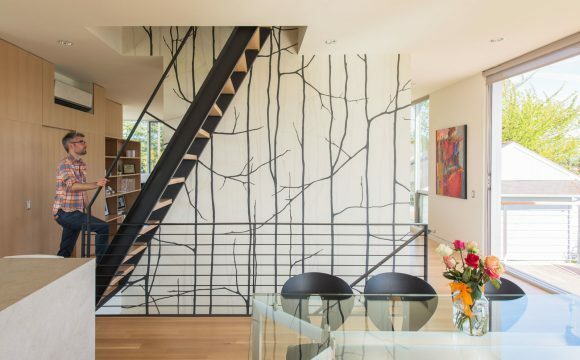 In this instance, the blackened steel of the nonconforming stair structure attaches to a 36” tall blackened steel guardrail which spans the length of the loft (minus the access opening). The arrangement of bedroom lofts in this design offers generous amounts of daylight and a treehouse effect within the lofts themselves. We took some liberties with the nonconforming stair at the new BUILD World Headquarters and tested out an experimental staircase. 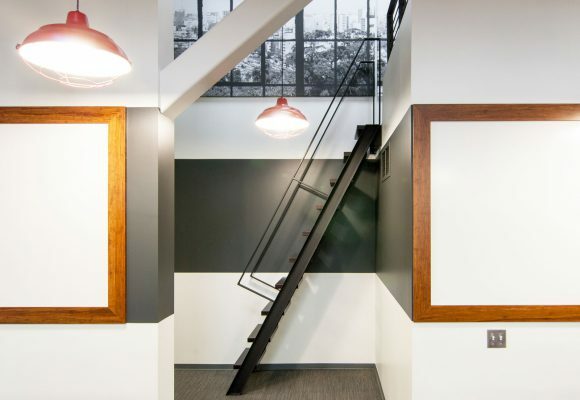 Because this nonconforming stair is the first view upon entering the office, we wanted it to appear less like vertical circulation and more like an intentional, beautiful display. 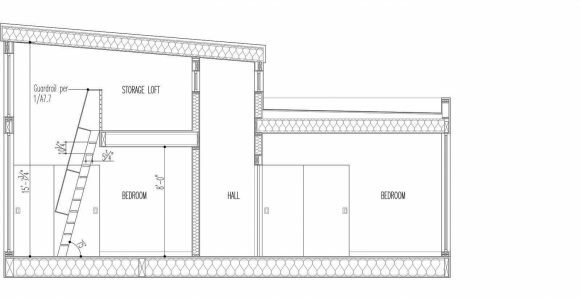 It does so while also providing access to loft storage and an informal lounge area, neither of which are used by anyone outside of Team BUILD. 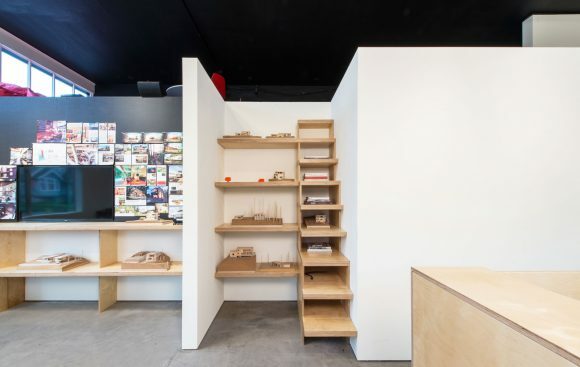 Every other tread of the nonconforming stair aligns with a shelf of the adjacent display space. The millwork is constructed of double layers of apple-ply and carries through to the shelving at the adjacent conference room. This composition creates nicely proportioned cubbies for physical models and books, as well as offering a staircase to the loft space above hidden in plain sight. Each of these examples is an evolution of the strategies we’ve implemented for using the nonconforming stairs. As our portfolio grows and project programs present a need for this type of access, you’ll continue to see this building code exception explored in our current and future designs.